The target of the level is really scary. But be calm and start playing. 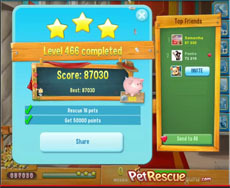 Your primary goal should be to “drive” pets in the penultimate line, activate the line blaster and use it in the last line to rescue them. Repeat it as many times as it needed to complete the level. If in this effort you can rescue immediately some pets do it fearless. With this strategy we did a three stars score, without using any payable booster.